The chakras are organizing centers for the reception, assimilation, and transmission of life energies. They form the coordinating network of our mind/body system. They take the universal life force energy all around us, and “step it down” so that our physical body can use it for its functioning. The chakras are a connecting channel linking mind and body, spirit and matter, past and future. Due to their very crucial role, they must function effectively, therefore it is important to open and balance them on a regular basis. A Chakra Balancing session can be done as a 60-min stand-alone session or combined with another modality during a treatment. 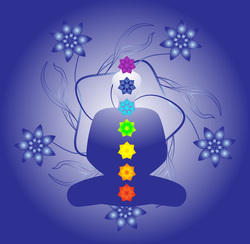 A Chakra Balancing session addresses the 7 major chakras, and it combines tools from various systems. Depending on the length of the session, tuning forks, reiki, and gemstones will be used, and may include some of the following elements: a short guided meditation involving breathing, colour and sound; visualization; esoteric healing.